His Holiness’ black Mercedes drove slowly down the tree-lined Soor Street to a welcoming crowd waiting in front of the German Rigpa Center, Dharma Mati. Colorful katas added a brightness to the greenery and the traditional red brick, arched façade of the elegant building. His Holiness stopped to greet a few people on his way in to the place where he will stay during his visit to Berlin. The center’s spacious shrine hall was brilliant with huge gold brocaded images of the Buddha’s life and also of Guru Rinpoche, the central figure for the Nyingma and also key to the Kagyu. Actually, the Karmapa is known as an emanation of Guru Rinpoche, a truth which was abundantly clear during the Kagyu Monlam this year in Bodhgaya which focused on Guru Rinpoche. The Karmapa embodied him during the lama dancing, a Guru Rinpoche practice was performed for four days, and the Karmapa gave two Guru Rinpoche empowerments. Today, after entering the shrine room, the Karmapa must have felt very much at home during the prayers to Guru Rinpoche and the recitation of his mantra, led by a woman with a beautiful voice. 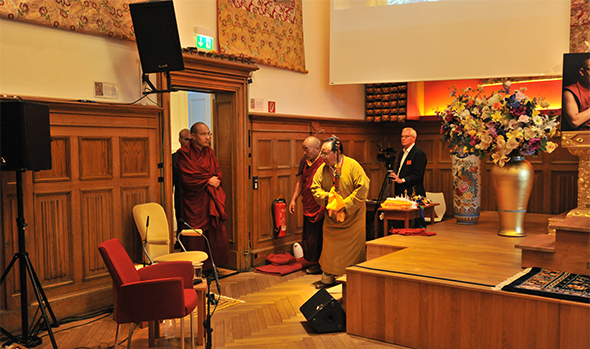 The head of all the Rigpa centers, Sogyal Rinpoche, gave a very warm welcome to the Karmapa, saying that His Holiness is “….considered to be one of the most important lamas alive today after His Holiness the Dalai Lama. The Gyalwang Karmapa has been acknowledged as one of the most brilliant representatives of a new generation of spiritual leaders. He has a modern pragmatic attitude while embodying completely the Buddhist spiritual tradition, its culture and values…. “As a scholar, a meditation master, a painter, poet, song writer, playwright—a great artist—the Gyalwang Karmapa continues the enlightened activities of the Karmapas over the centuries. In addition, he’s an environmental activist and a computer enthusiast, whose teachings are often webcast live. 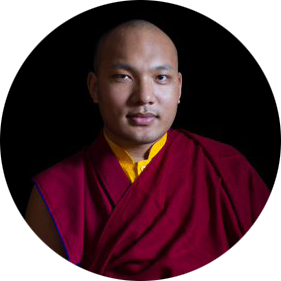 The 17th Gyalwang Karmapa is someone who is actually aware of the problems of today and has brought the wisdom and the compassion of his unique lineage fully into the 21st century…. “He is the teacher for now. I see in him all the qualities we need: he’s an artist and environmentalist, and very practical. No wonder the Gyalwang Karmapa would manifest in an incarnation that is suited for this time. I really am extremely inspired by his activity. If there’s any way that myself or the Rigpa sangha as a whole can serve in your vision or in your activities, we will be there at your service.” Sogyal Rinpoche’s heartfelt speech was followed by a brief offering of a mandala and the representations of body, speech, and mind. The Karmapa then spoke to the hundreds of students who had been especially invited to this meeting. “This is the first time I’m coming to Europe, and it took a long time. At the age of seven, I was recognized as the Karmapa, and since then, I’ve been meeting people from Europe, who have asked me to come here. Now I’m twenty-nine, so it took many years.” The Karmapa expressed his gratitude to Sogyal Rinpoche for hosting him in Berlin and giving him such a warm welcome. Thus the warm and open welcome of the Karmapa to Berlin came to a close with prayers to Tara, the female embodiment of enlightenment, aspirations for the Dharma and the activity of the Karmapa to spread, and a dedication for the benefit of all living beings.